Volleyball is a globally recognized sport that found its origins in the United States of America. In fact, worldwide, volleyball is second on the “popular list,” only behind soccer. Play is started by a player on one side serving the ball over the net into the opponents' field or court. The opponents then, without allowing the ball to strike the floor, return it, and it is in this way kept going back and forth until one side fails to return it or it hits the floor. This counts a "score" for one side, or a "server out" for the other, depending on the side in point. The game consists of nine innings, each side serving a certain number of times, as per the rules, per inning. The complete rules of volleyball are extensive, but in general, play proceeds as follows. Points are scored by grounding the ball on the opponents' court, or when the opponent commits a fault. The first team to reach 25 points wins the set and the first team to win three sets wins the match. Teams can contact the ball no more than three times before the ball crosses the net, and consecutive contacts must be made by different players. The ball is usually played with the hands or arms, but players can legally strike or push (short contact) the ball with any part of the body. 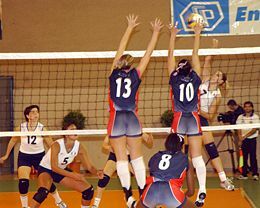 Through time, volleyball has developed to involve common volleyball techniques of spiking, passing, blocking, and setting, as well as specialized player positions and offensive and defensive structures. Because many plays are made above the top of the net, vertical jumping is an athletic skill emphasized in volleyball. This article focuses on competitive indoor volleyball, which is carefully regulated and played indoors. Numerous variations of volleyball have developed for casual play, as has the Olympic spin-off sport beach volleyball. On February 9, 1895, in Holyoke, Massachusetts (USA), William G. Morgan, a YMCA physical education director, created a new game called Mintonette as a pastime to be played by any number of players and preferably indoors. The game took some of its characteristics from tennis and handball. At the same time, James A. Naismith's invention of basketball was also on the rise, having been brought into existence just ten miles (16 km) away in the city of Springfield, Massachusetts. Mintonette (as volleyball was then known) was designed to be an indoor sport less rough than basketball for older members of the YMCA, while still requiring a bit of athletic effort. The first rules, written down by William G. Morgan, called for a net 6 feet 6 inches (1.98 meters) high, a 25 × 50 foot (7.6 × 15.2 meter) court, and any number of players. A match was composed of nine innings with three serves for each team in each inning, and no limit to the number of ball contacts for each team before sending the ball to the opponents’ court. In case of a serving error, a second try was allowed. Hitting the ball into the net was considered a foul (with loss of the point or a side-out)–except in the case of the first-try serve. To protect the fingers of the ladies, they were allowed to catch the ball and then throw it back into play. In Mintonette, the serving of the ball back and forth was reminiscent to that of tennis volleys, and hence came the name, volleyball. After an observer, Alfred Halstead, noticed the volleying nature of the game at its first exhibition match in 1896, played at the Springfield YMCA, the game quickly became known as volleyball (it was originally spelled as two words: "volley ball"). Volleyball rules were slightly modified by the Springfield YMCA and the game spread around the country to other YMCA locations. The first game was played on July 7, 1900, at Springfield College, and the game spread to Canada, the Orient, the Southern Hemisphere, and Cuba soon thereafter. In a mere seven years (1907), the sport was presented as one of the most popular sports in the Playground of America convention. 1913 At the end of this year, volleyball had spread its wings throughout the world and back, leavings its imprints in Puerto Rico, Uruguay, and Brazil. Volleyball competitions became a part of the Far Eastern Games. In 1916, in the Philippines, an offensive style of passing the ball in a high trajectory to be struck by another player (the set and spike) were introduced. The Filipinos developed the "bomba" or kill, and called the hitter a "bomberino." 1916 - The NCAA was invited by the YMCA to aid in editing the rules and in promoting the sport. Volleyball was added to school and college physical education and intramural programs. The score was changed from 21 points to 15 in the following year. In 1919, American Expeditionary Forces distributed 16,000 volleyballs to their troops and allies: this provided a stimulus for the growth of volleyball outside the United States. In 1930, the first two-man beach game was played. In 1934, the approval and recognition of national volleyball referees. At the AAU convention in Boston, 1937, the U.S. Volleyball Association was recognized as the official national governing body in the U.S.
Forearm pass introduced to the game (as a desperation play). Most balls were still played with the overhand pass in 1946. A study of recreation in the United States showed that volleyball ranked fifth among team sports being promoted and organized. An international federation, the Fédération Internationale de Volleyball (FIVB), was founded in 1947, and the first World Championships were held in 1949 for men and 1952 for women. 1949 USVBA added a collegiate division, for competitive college teams. For the first ten years collegiate competition was sparse. Teams were formed only through the efforts of interested students and instructors. Many teams dissolved when the interested individuals left the college. Competitive teams were scattered, with no collegiate governing bodies providing leadership in the sport. The first country outside the United States to adopt volleyball was Canada in 1900. Volleyball was added to the program of the Olympic Games in 1964. The sport is now popular in Brazil, in Europe (where especially Italy, the Netherlands and countries from Eastern Europe have been major forces since the late 1980s), in Russia, and in other countries including China and the rest of Asia, as well in as the United States. In 1951, volleyball was played by over 50 million people each year in over 60 countries. Four years later, in 1955, even the Pan American games incorporated volleyball in their competitions. The International Olympic Committee (IOC) designated volleyball as an Olympic team sport in 1957, to be included in the 1964 Olympic Games. The International University Sports Federation (FISU) held the first University Games in Turin, Italy in 1959. Volleyball was one of the eight competitions held. In 1960, seven midwestern institutions formed the Midwest Intercollegiate Volleyball Association (MIVA), followed by the Southern California Intercollegiate Volleyball Association in 1964. In the 1960s new techniques added to the game included the soft spike (dink), forearm pass (bump), blocking across the net, and defensive diving and rolling. In 1964, Volleyball was introduced to the Olympic Games in Tokyo. The Japanese volleyball used in the 1964 Olympics, consisted of a rubber carcass with leather paneling. A similarly constructed ball is used in most modern competition. In 1965, the California Beach Volleyball Association (CBVA) was formed. Later, in 1968 National Association of Intercollegiate Athletics (NAIA) made volleyball their fifteenth competitive sport. At the end of the decade, in 1969, The Executive Committee of the NCAA proposed the addition of volleyball to its program. In 1974, the World Championships in Mexico were telecast in Japan. The next year, the US National Women's team began a year-round training regime in Pasadena, Texas, (moved to Colorado Springs in 1979, Coto de Caza and Fountain Valley, California, in 1980, and San Diego in 1985). In 1977, the US National Men's team began a year-round training regime in Dayton, Ohio, (moved to San Diego in 1981). In 1983, the Association of Volleyball Professionals (AVP) was formed. In 1984, the US won their first medals at the Olympics in Los Angeles. The Men won the Gold, and the Women the Silver. 1986 marked the formation of the Women's Professional Volleyball Association (WPVA) was formed. In 1987, the FIVB added a Beach Volleyball World Championship Series. In 1988, the US men's squad repeated the Gold in the Olympics in South Korea. In 1989, the FIVB Sports Aid Program was created. In 1990, the World League was created. Two years later, the Four Person Pro Beach League was started in the United States. In 1994, Volleyball World Wide was created. In 1995, Volleyball celebrated its one hundredth anniversary. In 1996, two-person beach volleyball was added to the Olympics. The history of Olympic volleyball can be traced back to the 1924 Summer Olympics in Paris, where volleyball was played as part of an American sports demonstration event. After the foundation of FIVB and some continental confederations, it was first considered for official inclusion. In 1957, a special tournament was held at the 53rd IOC session in Sofia, Bulgaria to support such request. The competition was a success, and the sport was officially included in the program for the 1964 Summer Olympics. The Olympic volleyball tournament was originally a simple competition, whose format paralleled the one still employed in the World Cup: all teams played against each other team and then were ranked by wins, set average, and point average. One disadvantage of this round-robin system is that medal winners could be determined before the end of the games, making the audience lose interest in the outcome of the remaining matches. To cope with this situation, the competition was split into two phases with the addition of a "final round" elimination tournament consisting of quarterfinals, semifinals, and finals matches in 1972. The number of teams involved in the Olympic tournament has grown steadily since 1964. Since 1996, both men's and women's events count twelve participant nations. Each of the five continental volleyball confederations has at least one affiliated national federation involved in the Olympic Games. The U.S.S.R. won men's gold in both 1964 and 1968. After taking bronze in 1964 and silver in 1968, Japan finally won the gold for men's volleyball in 1972. Women's gold went to Japan in 1964 and again in 1976. That year, the introduction of a new offensive skill, the back row attack, allowed Poland to win the men's competition over the Soviets in a very tight five-set match. Since the strongest teams in men's volleyball at the time belonged to the Eastern Bloc, the American-led boycott of the 1980 Summer Olympics did not have as great an effect on these events as it had on the women's. The U.S.S.R. collected their third Olympic Gold Medal in men's volleyball with a 3-1 victory over Bulgaria (the Soviet women won that year as well, their third gold as well). With the U.S.S.R. boycotting the 1984 Olympic Games in Los Angeles, the U.S. was able to sweep Brazil in the finals for the men's gold medal. Italy won its first medal (bronze in the men's competition) in 1984, foreshadowing a rise in prominence for their volleyball teams. At the 1988 Games, Karch Kiraly and Steve Timmons led the U.S. men's team to a second straight gold medal. In 1992, underrated Brazil upset favorites C.I.S., Netherlands, and Italy in the men's competition for the country's first Olympic gold medal. Runner-up Netherlands, men's silver medalist in 1992, came back under team leaders Ron Zwerver and Olof van der Meulen in the 1996 Games for a five-set win over Italy. A men's bronze medalist in 1996, Serbia and Montenegro (playing in 1996 and 2000 as the Federal Republic of Yugoslavia) beat Russia in the gold medal match in 2000. In 2004, Brazil won its second men's volleyball gold medal beating Italy in the finals. ACE - A serve that is not passable and results immediately in a point. ANTENNA - The vertical rods (normally white and red) mounted near the edges of the net. The antennas are mounted directly above the sidelines and are not-in-play. Antennas are not usually used on outdoor nets. APPROACH - Fast stride toward the net by a spiker before he jumps in the air. ASSIST - Passing or setting the ball to a teammate who attacks the ball for a kill. This stat is normally only logged for high school, college, and National/Olympic team play. ATTACK - The offensive action of hitting the ball. The attempt by one team to terminate the play by hitting the ball to the floor on the opponent's side. ATTACK BLOCK - Receiving players' aggressive attempt to block a spiked ball before it crosses the net. ATTACK ERROR - An unsuccessful attack which does one of the following: 1) the ball lands out of bounds, 2) the ball goes into the net and terminates play or goes into the net on the third hit, 3) the ball is blocked by the opposition for a point or sideout, 4) the attacker is called for a center line violation, or 5) the attacker is called for illegal contact (lift, double hit…) on the attack. ATTACKER - Also "hitter" or "spiker." A player who attempts to hit a ball offensively with the purpose of terminating play in his or her team's favor. ATTACK LINE - A line 3m from the net that separates the front row players from the back row players. Commonly referred to as the "10-foot line." BACKCOURT - The area from the endline to the attack line. BACK SET - A set delivered behind the setter’s back, which is subsequently hit by an attacker. BACK ROW ATTACK – When a back row player attacks the ball by jumping from behind the 3m line before hitting the ball. If the back row player steps on or past the 3m line during take-off, the attack is illegal. BEACH DIG - An open hand receive of the ball, also called a "Deep Dish"
BLOCK - A defensive play by one or more players meant to deflect a spiked ball back to the hitter’s court. It may be a combination of one, two or three players jumping in front of the opposing spiker and contacting the spiked ball with the hands. BUMP – a common term for forearm passing. BALL HANDLING ERROR - Any time the official calls a double hit, a thrown ball or a lift (except on a serve reception or attack). For our purposes, this category also includes any blocking errors (when an official calls a blocker for a violation such as going into the net, centerline violation, reaching over the net, etc.). BUMP PASS - The use of joined forearms to pass or set a ball in an underhand manner. CAMPFIRE - A ball that falls to the floor in an area that's surrounded by two, three, four or more players. At the instant after the ball hits the floor, it appears as if the players are encircling and staring at a campfire. CENTER LINE - The boundary that runs directly under the net and divides the court into two equal halves. CLOSING THE BLOCK - The responsibility of the assisting blocker(s) to join the primary blocker and create an impenetrable block in which a ball cannot fit between the two individual blockers. CROSS COURT SHOT - An individual attack directed at an angle from one end of the offensive team's side of the net to the opposite sideline of the defensive team's court. CUT SHOT - A spike from the hitter's strong side that travels at a sharp angle across the net. DECOY - An offensive play meant to disguise the spiker who will receive the set. DEEP SET - Set to be hit away from the net to confuse or disrupt the timing of the blockers. DIG - Passing a spiked or rapidly hit ball. Slang for the art of passing an attacked ball close to the floor. DINK - A legal push of the ball around or over blockers. DOUBLE BLOCK - Two players working in unison to deflect an attacked ball at the net back to the hitter’s side. DOUBLE QUICK - Two hitters approaching the setter for a quick inside hit. DOUBLES - A game with two players on each side, most commonly played on a sand court. DOWN BALL - A ball the blockers elect not to attempt to block because it has been set too far from the net or the hitter is not under control. A "Down Ball" is hit overhand and driven over the net with topspin while the player remains standing. "Down Ball," is usually called aloud by the defense when it becomes apparent the attacker has no chance of hitting a powerful spike. FIVE-ONE – A 6-player offensive system that uses five hitters and one setter. FIVE SET – A back set to the right front hitter. FLARE – Inside-out path of an outside spiker who hid behind a quick hitter. FLOATER - A serve which does not spin or rotate and therefore moves in an erratic path. This is similar to a "knuckle ball" pitch in baseball. FOREARM PASS - Join your arms from the elbows to the wrists and strike the ball with the fleshy part of your forearms in an underhand motion. FOUL - A violation of the rules. FOUR SET - A set 1' from the sideline, and 1’ to 2' above the net. FOUR-TWO - A 6-player offensive system using four hitters and two setters. FREE BALL - A ball that will be returned by a pass rather than a spike. This is usually called aloud by the defense instructing players to move into serve receive positions. HELD BALL - A ball that comes to rest during contact resulting in a foul. HIT - To jump and strike the ball with an overhand, forceful shot. HITTER - Also "spiker" or "attacker"
INSIDE SHOOT - A playset or a 33. ISOLATION PLAY - Designed to isolate the attacker on a specific defender, normally to exploit a weakness or give a hitter a chance to hit against a single block. JUNGLE BALL - Any volleyball game with people who don't really know how to play volleyball. A common euphemism for this type of game is "Picnic Volleyball." JUMP SERVE - A serve that is started by the server tossing the ball into the air and jumping into and hitting the ball in its downward motion. JOUST – When 2 opposing players are simultaneously attempting to play a ball above the net. KEY - To predict a team's next play by observation of patterns or habits. KILL - An attack that results in an immediate point or side out. LINE - The marks that serve as boundaries of a court. LINE SHOT - A ball spiked down an opponent's sideline, closest to the hitter and outside the block. MIDDLE-BACK - A defensive system that uses the middle back player to cover deep spikes. MIDDLE-UP - A defensive system that uses the middle back player to cover dinks or short shots. MINTONETTE - The original name of the game of volleyball, created by William Morgan. MULTIPLE OFFENSE - A system of play using different types of sets other than just normal outside sets. OFFSIDE BLOCK - Player at the net, which is on the side away from the opponent's attack. OFF-SPEED HIT - Any ball spiked with less than maximum force but with spin. OVERHAND PASS - A pass executed with both hands open, controlled by the fingers and thumbs, played just above the forehead. OVERHAND SERVE - Serving the ball and striking it with the hand above the shoulder. OVERLAP – refers to the positions of the players in the rotation prior to the contact of the ball when serving. PANCAKE - A one-handed defensive technique where the hand is extended and the palm is slid along the floor as the player dives or extension rolls, and timed so that the ball bounces off the back of the hand. PASS – see "Forearm Pass"
PENETRATION – The act of reaching across and breaking the plane of the net during blocking. POINT OF SERVICE - A serve that results in a point (an ace by NCAA standards) as the serve is not returnable due to a bad pass by the receiver, this number includes aces. POWER ALLEY - A cross-court hit traveling away from the spiker to the farthest point of the court. POWER TIP – A ball that is pushed or directed with force by an attacking team. POWER VOLLEYBALL - A competitive style of volleyball started by the Japanese. QUICK SET – a set (usually 2’ above the net) in which the hitter is approaching the setter, and may even be in the air, before the setter delivers the ball. This type of set requires precise timing between the setter and hitter. READY POSITION - The flexed, yet comfortable, posture a player assumes before moving to contact the ball. RECEPTION ERROR - A serve that a player should have been able to return, but results in an ace (and only in the case of an ace). If it is a "husband/wife" play (where the ball splits the two receivers), the receiving team is given the reception error instead of an individual. RED CARD – a severe penalty in which an official displays a red card. The result of a red card may be a player is disqualified, the team loses the serve, or the team loses a point. A red card may be given with or without a prior yellow card as a warning; it is up to the official’s discretion. ROOF - A ball that when spiked is blocked by a defensive player such that the ball deflects straight to the floor on the attacker’s side. ROTATION - The clockwise movement of players around the court and through the serving position following a side out. SERVE - One of the six basic skills; used to put the ball into play. It is the only skill controlled exclusively by one player. SERVER - The player who puts the ball into play. SERVICE ERROR - An unsuccessful serve in which one or more of the following occurs: 1) the ball hits the net or fails to clear the net, 2) the ball lands out of bounds, or 3) the server commits a foot fault. SERVICE WINNER - A point the serving team scores when this player has served the ball. The point can be an immediate (in the case of an ace) or delayed (a kill or opponent attack error after a long rally). Therefore, the sum of the team's service winners equals their score. SET - The tactical skill in which a ball is directed to a point where a player can spike it into the opponent's court. SETTER – the player who has the 2nd of 3 contacts of the ball who "sets" the ball with an "Overhand Pass" for a teammate to hit. The setter normally runs the offense. SIDE OUT - Occurs when the receiving team successfully puts the ball away against the serving team, or when the serving team commits an unforced error, and the receiving team thus gains the right to serve. SIX PACK – Occurs when a blocker gets hit in the head or face by a spiked ball. SIX-TWO – A 6-player offense using 2 setters opposite one another in the rotation. Setter 1 becomes a hitter upon rotating into the front row as setter 2 rotates into the back row and becomes the setter. SPIKE - Also hit or attack. A ball contacted with force by a player on the offensive team who intends to terminate the ball on the opponent's floor or off the opponent's blocker. STRONG SIDE - When a right-handed hitter is hitting from the left-front position or when a left-handed hitter is hitting from the right-front position. STUFF - A ball that is deflected back to the attacking team's floor by the opponent's blockers. A slang term for "block." TURNING IN – the act of an outside blocker turning his/her body into the court so as to ensure the blocked ball is deflected into the court and lands in-bounds. UNDERHAND SERVE – a serve in which the ball is given a slight under-hand toss from about waist high and then struck with the opposite closed fist in an "underhand pitching" motion. WEAK SIDE – When a right-handed player is hitting from right-front position or when a left-handed player is hitting from the left-front position. YELLOW CARD – a warning from an official indicated by the display of a yellow card. Any player or coach who receives two yellow cards in a match is disqualified. A single yellow card does not result in loss of point or serve. The game is played on a volleyball court 18 meters long and 9 meters wide, divided into two 9 x 9 meter halves by a one-meter wide net placed so that the top of the net is 2.43 meters above the center of the court for men's competition, and 2.24 meters for women's competition (these heights are varied for veterans and junior competitions). 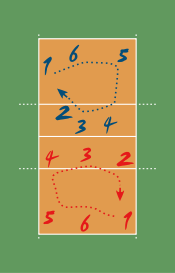 After a team gains the serve (also known as siding out), its members must rotate in a clockwise direction, with the player previously in area "2" moving to area "1" and so on, with the player from area "1" moving to area "6" (see also the Errors and faults section). The team courts are surrounded by an area called the free zone which is a minimum of 3 meters wide and which the players may enter and play within after the service of the ball. All lines denoting the boundaries of the team court and the attack zone are drawn or painted within the dimensions of the area and are therefore a part of the court or zone. If a ball comes in contact with the line, the ball is considered to be "in." An antenna is placed on each side of the net perpendicular to the sideline and is a vertical extension of the side boundary of the court. A ball passing over the net must pass completely between the antennae (or their theoretical extensions to the ceiling) without contacting them. The volleyball is made of leather or synthetic leather and inflated with compressed air. It is round and 65-67 cm in circumference. Its weight is 260-280 g. Its inside pressure should be 0.30 to 0.325 kg/cm2 (4.26 to 4.61 psi) (294.3 to 318.82 mbar or hPa). Each team consists of six players. To get play started, a team is chosen to serve by coin toss. A player from the serving team (the server) throws the ball into the air and attempts to hit the ball so it passes over the net on a course such that it will land in the opposing team's court (the serve). The opposing team must use a combination of no more than three contacts with the volleyball to return the ball to the opponent's side of the net. These contacts usually consist first of the bump or pass so that the ball's trajectory is aimed towards the player designated as the setter; second of the set (usually an over-hand pass using wrists to push finger-tips at the ball) by the setter so that the ball's trajectory is aimed towards a spot where one of the players designated as an attacker can hit it, and third by the attacker who spikes (jumping, raising one arm above the head and hitting the ball so it will move quickly down to the ground on the opponent's court) to return the ball over the net. The team with possession of the ball that is trying to attack the ball as described is said to be on offense. The team on defense attempts to prevent the attacker from directing the ball into their court: players at the net jump and reach above the top (and if possible, across the plane) of the net in order to block the attacked ball. If the ball is hit around, above, or through the block, the defensive players arranged in the rest of the court attempt to control the ball with a dig (usually a fore-arm pass of a hard-driven ball). After a successful dig, the team transitions to offense. The game continues in this manner, rallying back and forth, until the ball touches the court within the boundaries or until an error is made. The ball lands out of the court, in the same court as the team that touched it last, under the net to the opposing team's court, or the ball touches the net "antennas." The ball also may not pass over or outside the antennas even if it lands in the opponents' court1. The ball is touched more than three times before being returned to the other team's court2. The same player touches the ball twice in succession3. A player "lifts" or "carries" the ball (the ball remains in contact with the player's body for too long). A player touches the net with any part of his or her body or clothing while making a play on the ball (with the exception of the hair). The players of one team do not manage to touch the ball before the ball lands in their half of the court. A back-row player spikes the ball while it is completely above the top of the net, unless he or she jumped from behind the attack line (the player is, however, allowed to land in front of the attack line). A back-row player participates in a completed block of the opposing team's attack (completed means at least one blocker touched the ball). The libero, a defensive player who can only play in the back row, attempts a block or makes an "attacking hit," defined as any shot struck while the ball is entirely above the top of the net. A player completes an attack hit from higher than the top of the net when the ball is coming from an overhand finger pass (set) by a libero in the front zone. A player is not in the correct position at the moment of serve, or serves out of turn. This type of foul is related to the position currently occupied by the players (see the table in the Equipment section). When ball is served, players can place themselves freely on the field (e.g. a "back-row" player can be close to the net) so long as they obey the following rules: The area "1" player must be behind the area "2" player and to the right of the area "6" player. The area "6" player must be behind area "3" player, to the left of area "1" player and to the right of area "5." The area "5" player must be behind the area "4" player and to the left of the area "6" player. Symmetric rules must be respected by the front-row players (those in areas "2," "3" and "4"). When hitting, a player makes contact with the ball in the space above the opponent's court (in blocking an attack hit, this is allowed). A player touches the opponent's court with any part of his or her body except the feet or hands4. When serving, a player steps on the court or the end line before making contact with the ball. A player takes more than 8 seconds to serve. At the moment of serve, one or more players jump, raise their arms or stand together at the net in an attempt to block the sight of the ball from the opponent (screening)5. A player blocks the serve or attacks the serve when the ball is in the front zone and above the top of the net. 1 If the ball passes outside the antennas on the first contact for the team, e.g., as the result of a bad pass or dig, a player is allowed to go after the ball as long as he or she does not touch the opponent's court and the ball travels back to his or her team's court also outside the antennas. 2 Except if a player blocks (touches a ball sent over the net by the opposing team, while reaching above the top of the net) a ball that stays in the blocker's side of the net. In such an instance the blocker may play the ball another time without violating the rule against playing the ball twice in succession. If the ball is touched during a block, that contact is not considered one of the team's three contacts. 3 At the first hit of the team, the ball may contact various parts of the body consecutively provided that the contacts occur during one action. Also, when a player touches the ball on a block, he or she may make another play on the ball. 4 Penetration under the net with hands or feet is allowed only if a portion of the penetrating hands or feet remains in contact with or directly above the player's court or center line. Before 1999, points could be scored only when a team had the serve (side-out scoring) and all sets went up to only 15 points. The FIVB changed the rules in 1999 (with the changes being compulsory in 2000) to use the current scoring system (formerly known as rally point system), primarily to make the length of the match more predictable and to make the game more spectator- and television-friendly. In 1998 the libero player was introduced internationally, the term meaning free in Italian; the NCAA introduced the libero in 2002. The libero is a player specialized in defensive skills: the libero must wear a contrasting jersey color from his or her teammates and cannot block or attack the ball when it is entirely above net height. When the ball is not in play, the libero can replace any back-row player, without prior notice to the officials. This replacement does not count against the substitution limit each team is allowed per set, although the libero may be replaced only by the player whom they replaced. The libero may function as a setter only under certain restrictions. 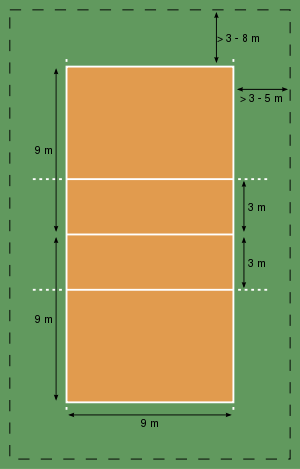 If she/he makes an overhand set, she/he must be standing behind (and not stepping on) the 3-meter line; otherwise, the ball cannot be attacked above the net in front of the 3-meter line. An underhand pass is allowed from any part of the court. The libero is the most skilled defensive player on the team. There is also a libero tracking sheet, where the referees or officiating team must keep track of who the libero subs in and out for. There may only be one libero per set (game), although there may be a different libero in the beginning of any new set (game). Furthermore, a libero is not allowed to serve, according to international rules, with the exception of the NCAA women's volleyball games, where a 2004 rule change allows the libero to serve, but only in a specific rotation. That is, the libero can only serve for one person, not for all of the people for whom she goes in. Other rule changes enacted in 2000 include the introduction of the let serve which allows play to continue even if a served ball touches the net as long as it continues into the opponents' court. Also, the service area was expanded to allow players to serve from anywhere behind the end line but still within the theoretical extension of the sidelines. Other changes were made to lighten up calls on faults for carries and double-touches, such as allowing multiple contacts by a single player ("double-hits") on a team's first contact. From 2006 there are plans for trying new rule changes, such as having a second serve option when failing the first (as in tennis) or a second alternative libero in the team. Competitive teams master six basic skills: serve, pass, set, attack, block and dig. Each of these skills comprises a number of specific techniques that have been introduced over the years and are now considered standard practice in high-level volleyball. Setting up for an overhand serve. 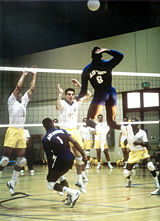 A man making a jump serve. A woman making a forearm pass or bump. A player stands behind the endline and serves the ball, in an attempt to drive it into the opponent's court. His or her main objective is to make it land inside the court; it is also desirable to set the ball's direction, speed and acceleration so that it becomes difficult for the receiver to handle it properly. A serve is called an "ace" when the ball lands directly onto the court or travels outside the court after being touched by an opponent. Underhand and Overhand Serve: refers to whether the player strikes the ball from below, at waist level, or first tosses the ball in the air and then hits it above shoulder level. Underhand serve is considered very easy to receive and is rarely employed in high-level competitions. Sky Ball Serve: a specific type of underhand serve occasionally used in beach volleyball, where the ball is hit so high it comes down almost in a straight line. This serve was invented and employed almost exclusively by the Brazilian team in the early 1980s and is now considered outdated. Line and Cross-Court Serve: refers to whether the ball flies in a straight trajectory parallel to the side lines, or crosses through the court in an angle. Top Spin: an overhand serve where the ball gains topspin through wrist snapping. Floater: an overhand serve where the ball is hit with no spin so that its path becomes unpredictable. This type of serve can be administered while jumping or standing. This is akin to a knuckleball in baseball. 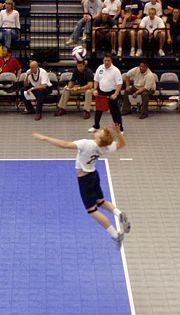 Jump Serve: an overhand serve where the ball is first tossed high in the air, then the player makes a timed approach and jumps to make contact with the ball. There is usually much topspin imparted on the ball. This is the most popular serve amongst college and professional teams. Jump Float: This is a serve like the jump serve and the floater. The ball is tossed lower than a topspin jump serve, but contact is still made while in the air. Round-House Serve: the player stands with one shoulder facing the net, tosses the ball high and hits it with a fast circular movement of the arm. The ball is hit with the palm of the hand, creating a lot of topspin. Hybrid Serve: An overhand serve delivered similarly to a top spin serve; however, it has more pace than a floater, but has a similar unpredictable path. Also called reception, the pass is the attempt by a team to properly handle the opponent's serve, or any form of attack. Proper handling includes not only preventing the ball from touching the court, but also making it reach the position where the setter is standing quickly and precisely. The skill of passing involves fundamentally two specific techniques: underarm pass, or bump, where the ball touches the inside part of the joined forearms or platform, at waist line; and overhand pass, where it is handled with the fingertips, like a set, above the head. The set is usually the second contact that a team makes with the ball. The main goal of setting is to put the ball in the air in such a way that it can be driven by an attack into the opponent's court. The setter coordinates the offensive movements of a team, and is the player who ultimately decides which player will actually attack the ball. As with passing, one may distinguish between an overhand and a bump set. Since the former allows for more control over the speed and direction of the ball, the bump is used only when the ball is so low it cannot be properly handled with fingertips, or in beach volleyball where rules regulating overhand setting are more stringent. In the case of a set, one also speaks of a front or back set, meaning whether the ball is passed in the direction the setter is facing or behind the setter. There is also a jump set that is used when the ball is too close to the net. In this case the setter usually jumps off his or her right foot straight up to avoid going into the net. The setter usually stands about two thirds of the way from the left to the right of the net and faces the left (the larger portion of net that he or she can see). Sometimes a setter refrains from raising the ball for a teammate to perform an attack and tries to play it directly onto the opponent's court. This movement is called a "dump". The most common dumps are to 'throw' the ball behind the setter or in front of the setter to zones 2 and 4. More experienced setters toss the ball into the deep corners or spike the ball on the second hit. The attack (or spike, the slang term) is usually the third contact a team makes with the ball. The object of attacking is to handle the ball so that it lands on the opponent's court and cannot be defended. A player makes a series of steps (the "approach"), jumps, and swings at the ball. Ideally the contact with the ball is made at the apex of the hitter's jump. At the moment of contact, the hitter's arm is fully extended above his or her head and slightly forward, making the highest possible contact while maintaining the ability to deliver a powerful hit. The hitter uses arm swing, wrist snap, and a rapid forward contraction of the entire body to drive the ball. A 'bounce' is a slang term for a very hard/loud spike that follows an almost straight trajectory steeply downward into the opponent's court and bounces very high into the air. Backcourt (or back row) attack: an attack performed by a back row player. The player must jump from behind the 3-meter line before making contact with the ball, but may land in front of the 3-meter line. Line and Cross-court Shot: refers to whether the ball flies in a straight trajectory parallel to the side lines, or crosses through the court in an angle. A cross-court shot with a very pronounced angle, resulting in the ball landing near the 3-meter line, is called a cut shot. Dip/Dink/Tip/Cheat: the player does not try to make a hit, but touches the ball lightly, so that it lands on an area of the opponent's court that is not being covered by the defense. Tool/Wipe/Block-abuse: the player does not try to make a hard spike, but hits the ball so that it touches the opponent's block and then bounces off-court. Off-speed hit: the player does not hit the ball hard, reducing its acceleration and thus confusing the opponent's defense. Quick hit/"One": an attack (usually by the middle blocker) where the approach and jump begin before the setter contacts the ball. The set (called a "quick set") is placed only slightly above the net and the ball is struck by the hitter almost immediately after leaving the setter's hands. Slide: a variation of the quick hit that uses a low back set. The middle hitter steps around the setter and hits from behind him or her. Double quick hit/"Stack"/"Tandem": a variation of quick hit where two hitters, one in front and one behind the setter or both in front of the setter, jump to perform a quick hit at the same time. It can be used to deceive opposite blockers and free a fourth hitter attacking from backcourt, maybe without block at all. Blocking refers to the actions taken by players standing at the net to stop or alter an opponent's attack. A block that is aimed at completely stopping an attack, thus making the ball remain in the opponent's court, is called offensive. A well-executed offensive block is performed by jumping and reaching to penetrate with one's arms and hands over the net and into the opponent's area. The jump should be timed so as to intercept the ball's trajectory prior to it crossing over the net. Palms are held deflected downward about 45-60 degrees toward the interior of the opponent's court. A "roof" is a spectacular offensive block that redirects the power and speed of the attack straight down to the attacker's floor, as if the attacker hit the ball into the underside of a peaked house roof. By contrast, it is called a defensive, or "soft" block if the goal is to control and deflect the hard-driven ball up so that it slows down and becomes more easy to be defended. A well-executed soft-block is performed by jumping and placing one's hands above the net with no penetration into the opponent's court and with the palms up and fingers pointing backward. Blocking is also classified according to the number of players involved. Thus, one may speak of single (or solo), double, or triple block. Successful blocking does not always result in a "roof" and many times does not even touch the ball. While it’s obvious that a block was a success when the attacker is roofed, a block that consistently forces the attacker away from his or her 'power' or preferred attack into a more easily controlled shot by the defense is also a highly successful block. At the same time, the block position influences the positions where other defenders place themselves while opponent hitters are spiking. Woman going for a dig. Digging is the ability to prevent the ball from touching one's court after a spike, particularly a ball that is nearly touching the ground. In many aspects, this skill is similar to passing, or bumping: overhand dig and bump are also used to distinguish between defensive actions taken with fingertips or with joined arms. Some specific techniques are more common in digging than in passing. A player may sometimes perform a "dive," i.e., throw his or her body in the air with a forward movement in an attempt to save the ball, and land on his or her chest. When the player also slides his or her hand under a ball that is almost touching the court, this is called a "pancake." Sometimes a player may also be forced to drop his or her body quickly to the floor in order to save the ball. In this situation, the player makes use of a specific rolling technique to minimize the chances of injuries. Coaching for volleyball can be classified under two main categories: match coaching and developmental coaching. The objective of match coaching is to win a match by managing a team's strategy. Developmental coaching emphasizes player development through the reinforcement of basic skills during exercises known as "drills." Drills promote repetition and refinement of volleyball movements, particularly in footwork patterns, body positioning relative to others, and ball contact. A coach will construct drills that simulate match situations thereby encouraging speed of movement, anticipation, timing, communication, and team-work. At the various stages of a player's career, a coach will tailor drills to meet the strategic requirements of the team. The American Volleyball Coaches Association is the largest organization in the world dedicated exclusively to volleyball coaching. An image from an international match between Italy and Russia in 2005. A Russian player on the left has just served, with three men of his team next to the net moving to their assigned block positions from the starting ones. Two others, in the back-row positions, are preparing for defense. Italy, on the right, has three men in a line, each preparing to pass if the ball reaches him. The setter is waiting for their pass while the middle hitter with no. 10 will jump for a quick hit if the pass is good enough. Alessandro Fei (no. 14) has no passing duties and is preparing for a back-row hit on the right side of the field. Note the two liberos with different color dress. Middle hitters/blockers are commonly substituted by liberos in their back-row positions. There are 5 positions filled on every volleyball team at the elite level. Setter, Outside Hitter/Left Side Hitter, Middle Hitter and Opposite Hitter/Right Side Hitter and Libero/Defensive Specialist. Each of these positions plays a specific, key role in winning a volleyball match. Setters have the task for orchestrating the offense of the team. They aim for second touch and their main responsibility is to place the ball in the air where the attackers can place the ball into the opponents' court for a point. They have to be able to operate with the hitters, manage the tempo of their side of the court and choose the right attackers to set. Setters need to have swift and skillful appraisal and tactical accuracy, and must be quick at moving around the court. Liberos are defensive players, who are responsible for receiving the attack or serve and are usually the players on the court with the quickest reaction time and best passing skills. Librero means 'free' as they have the ability to substitute for any other player on the court during each play. They do not necessarily need to be tall, as they never play at the net, which allows shorter players with strong passing and defensive skills to excel in the position and play an important role in the team's success. A player designated as a libero for a match may not play other roles during that match. Liberos wear a different color jersey than their teammates. Middle blockers or Middle hitters are players that can perform very fast attacks that usually take place near the setter. They are specialized in blocking, since they must attempt to stop equally fast plays from their opponents and then quickly set up a double block at the sides of the court. In non-beginners play, every team will have two middle hitters. Outside hitters attack from near the left antenna. Since most sets to the outside are high, the outside hitter may take a longer approach, always starting from outside the court sideline. In non-beginners play, there are again two outside hitters on every team in every match. Opposite hitters or Right side hitters carry the offensive workload for a volleyball team. Their primary responsibilities are to attack the ball from the right side and to put up a well formed block against the opponents Outside Hitters. This player hits the most balls on the team. He/she is set from the front row and the back row. Sets to the opposite usually go to the right side. The three standard volleyball formations are known as "4-2," "6-2" and "5-1," which refers to the number of hitters and setters respectively. 4-2 is a basic formation used only in beginners' play, while 5-1 is by far the most common formation in high-level play. The 4-2 formation has four hitters and two setters. The setters usually set from the middle front or right front position. The team will therefore have two front-row attackers at all times. In the international 4-2, the setters set from the right front position. The international 4-2 translates more easily into other form of offense. The setters line up opposite each other in the rotation. The typical lineup has two outside hitters. By aligning like positions opposite themselves in the rotation, there will always be one of each position in the front and back rows. After service, the players in the front row move into their assigned positions, so that the setter is always in middle front. Alternatively, the setter moves into the right front and has both a middle and an outside attacker; the disadvantage here lies in the lack of an offside hitter, allowing one of the other team's blockers to "cheat in" on a middle block. The clear disadvantage to this offensive formation is that there are only two attackers, leaving a team with fewer offensive weapons. Another aspect is to see the setter as an attacking force, albeit a weakened force, because when the setter is in the front court they are able to 'tip' or 'dump', so when the ball is close to the net on the second touch, the setter may opt to hit the ball over with one hand. This means that the blocker who would otherwise not have to block the setter is engaged and may allow one of the hitters to have an easier attack. In the 6-2 formation, a player always comes forward from the back row to set. The three front row players are all in attacking positions. Thus, all six players act as hitters at one time or another, while two can act as setters. So the 6-2 formation is actually a 4-2 system, but the back-row setter penetrates to set. The 6-2 lineup thus requires two setters, who line up opposite to each other in the rotation. In addition to the setters, a typical lineup will have two middle hitters and two outside hitters. By aligning like positions opposite themselves in the rotation, there will always be one of each position in the front and back rows. After service, the players in the front row move into their assigned positions. The advantage of the 6-2 is that there are always three front-row hitters available, maximizing the offensive possibilities. However, not only does the 6-2 require a team to possess two people capable of performing the highly specialized role of setter, it also requires both of those players to be effective offensive hitters when not in the setter position. At the international level, only the Cuban National Women's Team employs this kind of formation. It is also used in Women's NCAA play, partially due to the variant rules used which allow 15 substitutions per set (as opposed to the 6 allowed in the standard rules). The 5-1 formation has only one player who assumes setting responsibilities regardless of his or her position in the rotation. The team will therefore have three front-row attackers when the setter is in the back row, and only two when the setter is in the front row, for a total of five. The player opposite the setter in a 5-1 rotation is called the opposite hitter. In general, opposite hitters do not pass; they stand behind their teammates when the opponent is serving. The opposite hitter may be used as a third attack option (back-row attack) when the setter is in the front row: this is the normal option used to increase the attack capabilities of modern volleyball teams. Normally the opposite hitter is the most technical skilled hitter of the team. Back-row attacks generally come from the back-right position (position 1), but are increasingly performed from back-center in high-level play. The big advantage of this system is that the setter always has 3 hitters to vary sets with. If the setter does this well, the opponent's middle blocker may not have enough time to block with the outside hitter, increasing the chance for the attacking team to make a point. There is another advantage: when the setter is a front-row player, he or she is allowed to jump and "dump" the ball onto the opponent's side. This too can confuse the opponent's blocking players: the setter can jump and dump or can set to one of the hitters. A good setter knows this and thus won't only jump to dump or to set for a quick hit, but as well to confuse the opponent. The 5-1 offense is actually a mix of 6-2 and 4-2: when the setter is in the front row, the offense looks like a 4-2; when the setter is in the back row, the offense looks like a 6-2. There are many variations on the basic rules of volleyball. By far the most popular of these is beach volleyball, which is played on sand with two people per team, and rivals the main sport in popularity. The USYVL was formed in an effort to give young children the opportunity to begin developing early in terms of mental and physical growth, and gain exposure to ethics and morality in the world of sports. The focus is on children ages seven to fourteen. Their mission statement reads: "The United States Youth Volleyball League's mission is to provide every child between the ages of 7 and 14 a chance to learn and play volleyball in a fun, safe, supervised environment. One of the main tenets of the program is to encourage children to do their best with their abilities. With an emphasis on positive reinforcement, the program seeks to build confidence and self-esteem in each child." "Volleyball has always been a sport prepared to change with the times. The International Volleyball Federation (FIVB) has regularly altered and updated the rules of the game to encourage exciting play and improve spectator and television interest. Possibly volleyball's biggest change occurred in 1986 when the FIVB endorsed beach volleyball as an official discipline. Suddenly, volleyball fans could have their choice: two-a-side beach volleyball on sand or six-a-side volleyball in the gym. Both disciplines are now played at the Olympic Games." ↑ . olympics.org. Retrieved October 19, 2009. ↑ Chronological Highlights. FIVB accessdate 2007-01-30 quote- 1924: The Olympic Games in Paris. The program included a demonstration of "American" sports, and Volleyball was among these. 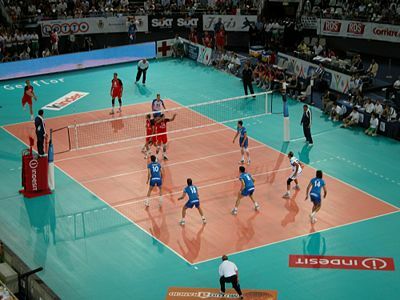 ↑ Official Volleyball Rules 2005. . (PDF) accessdate 2006-10-02 FIVB Section 1.1. quote - The playing court is […] surrounded by a free zone which is a minimum of 3 m wide on all sides. Retrieved October 19, 2009. ↑ Official Volleyball Rules 2005. . (PDF) accessdate 2006-09-12. FIVB Section 11.2: Penetration under the net. ↑ . US Youth Volleyball League. Retrieved October 19, 2009. ↑ . USA Volleyball. Retrieved October 19, 2009. ↑ . FIVB.org. Retrieved October 19, 2009. This page was last modified on 25 January 2016, at 17:36.